It is tempting to think of the Middle Ages and early Renaissance as a time of somber, sober living ruled by Church prohibitions on many types of behavior, including dance. A bit of research, however, reveals dancing was part of life for noble and commoner alike. Court dances tended to be somewhat more stately and were often the way in which the nobility would process into the great hall for a banquet or other entertainment. The Pavane and the Almain (also known as the Black Alman, the Allemande, and several other names) are examples of court processional dances. The Saltarello was a bit livelier, with steps that involve small kicks. In all these dances, the couple stood side-by-side, their bodies distinctly separated, each with an arm outstretched to grasp the hand of the other. By the later Renaissance, more lively dances were part of court life. Elizabeth I was known to be an avid dancer and was thought to be particularly fond of La Volta, a very daring dance in which the gentlemen lifts his partner into the air by holding her waist. Village dances often included more jumping and kicking. The Morris dance is an example that dates from the time of Edward III in England and is still performed exactly the same way today. If you think line dancing is a country-western invention, think again. 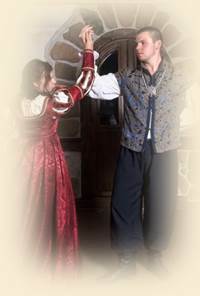 Line dances such as the Farandole were part of medieval fare. In the saga, I’ve generally kept to the dances of the late Middle Ages and early Renaissance. The one liberty I have taken is to include a Galliard (another of Elizabeth’s favorite dances). It is quite lively and somewhat daring in that the gentleman’s hand is placed on his partner’s back for a short time at one point in the dance. There are plenty of internet sources on medieval and Renaissance dance as well as good illustrative performances in period costume on YouTube.